Today we’d like to introduce you to Piersten Gaines. I grew up in the San Francisco Bay Area and was heavily involved in sports, particularly soccer. I traveled the country playing competitively on a nationally ranked team, and was on the Olympic developing team as well as the state team. Given my active lifestyle, figuring out what to do with my hair was always a problem. As an African-American, my hair texture doesn’t allow me to wash my hair more than once a week. It would literally break off if I did that. Playing sports 7 days a week made this difficult for me but it also made it critical that I find a quality stylist. Trying to find a quality stylist proved to be harder than I could have ever imagined. During my high school years, I had two stylists damage my hair so badly that it completely fell off on two separate occasions. Thanks to my parents, a lot of money was spent making sure that my hair grew back and did so without most of my peers knowing what was going on. I was recruited to play soccer at Columbia University in New York City, and again, encountered difficulty in finding a stylist that knew how to care for my hair. It was here that I realized that many of my friends of color were having the same trouble. Once I did finally find a stylist that I trusted, the salon experience was never really enjoyable. I spent hours in the salon for a service that really shouldn’t have taken more than 1.5 hours, and the salons often lacked professionalism. Post-graduation from Columbia, I stayed in New York and worked in the fashion retail industry including roles at Gilt Groupe, a luxury flash-sale retailer, and Bloomingdales. With aspirations to rise to the top of my career, I applied to business school, to equip myself with the hard business skills needed to run an organization. I was accepted into Harvard Business School for Fall 2016 matriculation, and learned early on during my time as a student that I would be interning at Wayfair during the summer between my two years at school. It was a great opportunity because it was in an industry that I knew and loved, but I was in a more strategic role than I had ever been in. I would really be able to apply the skills that I was learning in business school to my summer role! Tragedy struck during my second semester of my first year at HBS. My mother, my best friend, passed away from lymphoma. I still haven’t completely wrapped my head around the loss. It has been a deeper pain that I ever knew that I could feel. However, it put a lot of things in perspective for me as it pertained to my life and career goals. I successfully completed my summer internship at Wayfair, but I decided that life was too short to not be doing what I wanted to do every single day. I decided that I wanted to work on problems that actually mattered to me. I recognized that my unique experiences, and my business school skillset put me in a position that would allow me to actually solve problems that were affecting my community. 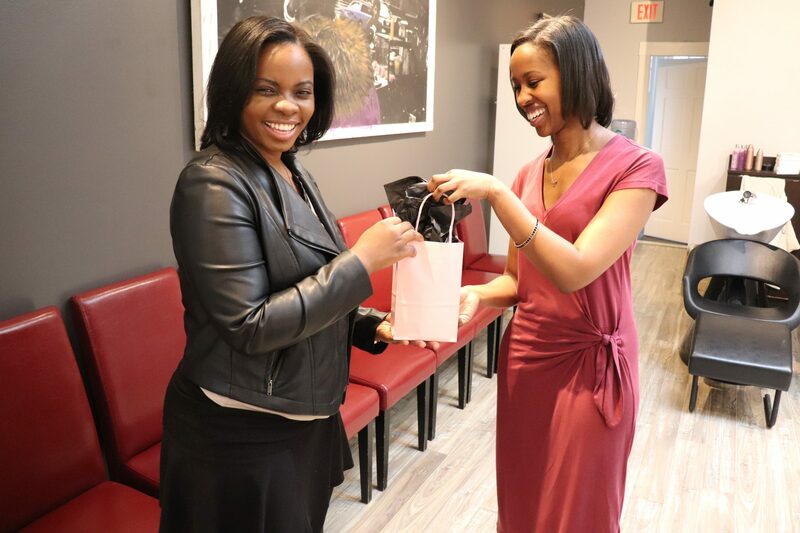 50% of Black women should not be experiencing hair loss at least once in their lives. That statistic is ridiculous! Especially knowing that the number one cause that this exists is because stylists don’t know how to properly care for our hair. Why is it that we can’t just schedule an appointment at the blowdry bar down the street and know that they will be able to take care of our hair the same way that they take care of our classmates’? With my newly minted business skillset, I want to solve this problem. This is why I created Pressed Roots. 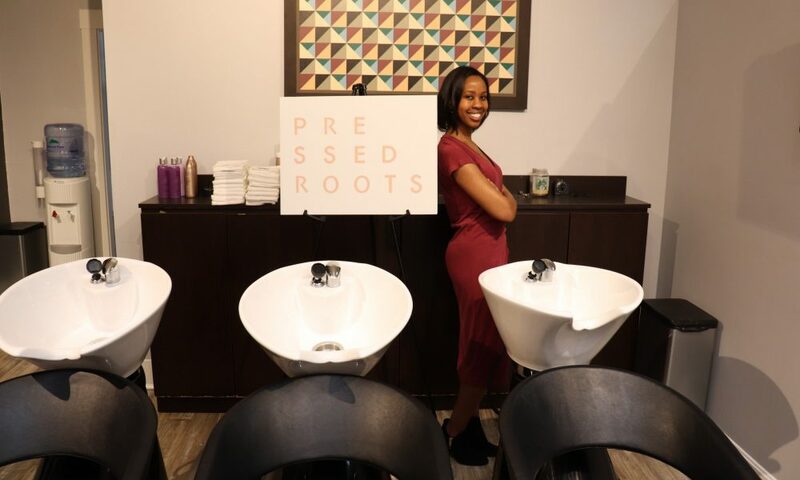 All women deserve to have easy access to healthy hair care, and Pressed Roots makes that possible. The huge success of the Boston – Newbury Street pop-up shop shows that this is a NEED! It was sold out in less than 2 days, and we had a waitlist of 75 people on it. My goal is to have a Pressed Roots open in every major in the United States. Definitely not a smooth road! First and foremost, I have learned how absolutely critical it is to keep positive people around me. As an entrepreneur, I hear the opinions of people telling me why my business won’t work, why I’m doing x wrong, or why y is a bad idea every single day. Everyone under the sun has an opinion. From the investors, to my classmates and peers – and to be honest, most people do not and will never see the vision like I see it. If I didn’t have the strong support group that I have, there’s no way that I would still be going. Alright – so let’s talk business. Tell us about Pressed Roots – what should we know? 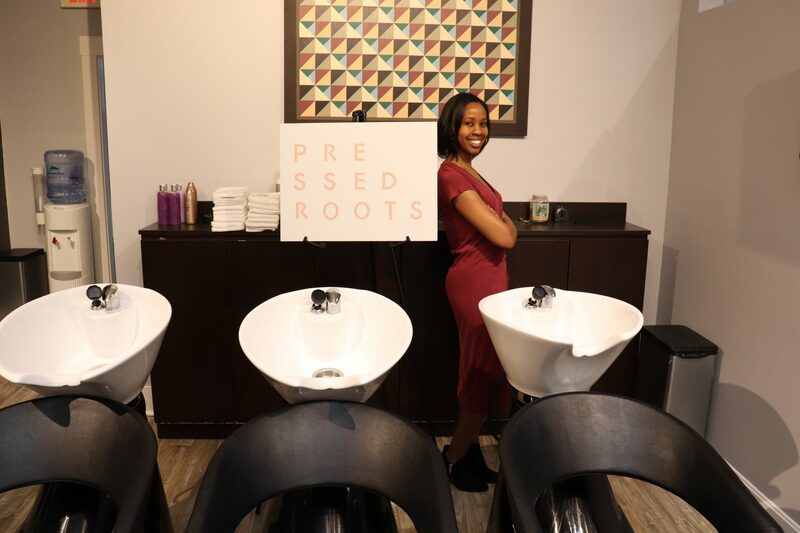 Pressed Roots is a solution for women, with highly textured hair, who struggle to find quality services and stylists that understand how to straighten their hair in a healthy, and fast way. 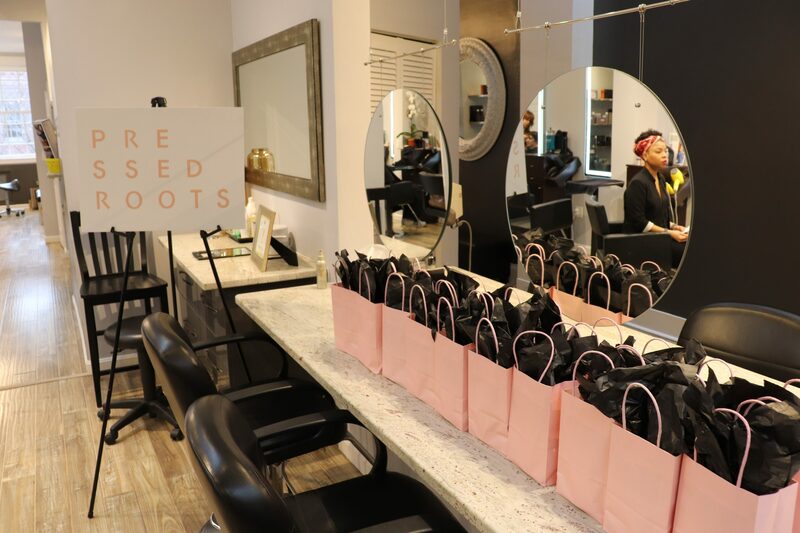 Like the Blow Dry Bars that disrupted the hair industry 8 years ago, Pressed Roots Salons specialize in all blow outs, all the time. 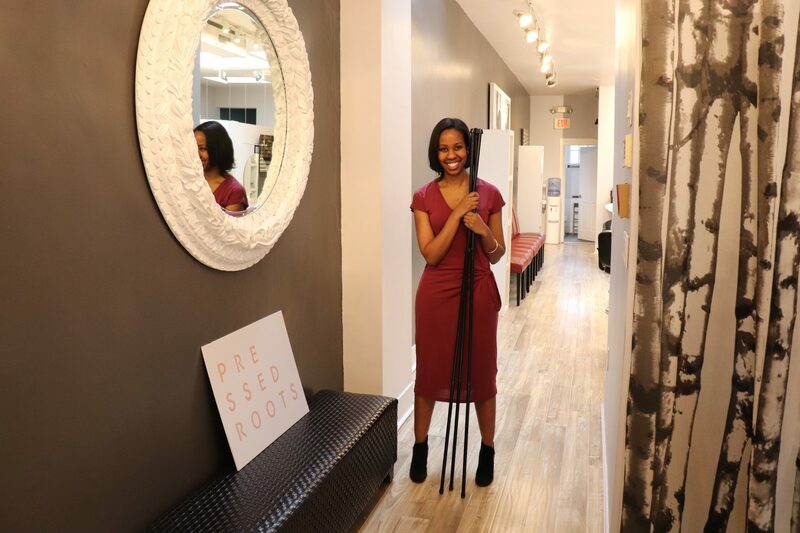 Unlike those Blow Dry Bars, Pressed Roots stylists serve the specific needs of women with highly textured hair by using a proven and repeatable technique that avoids damage, and gets customers out of the salon in under 2 hours every single time. 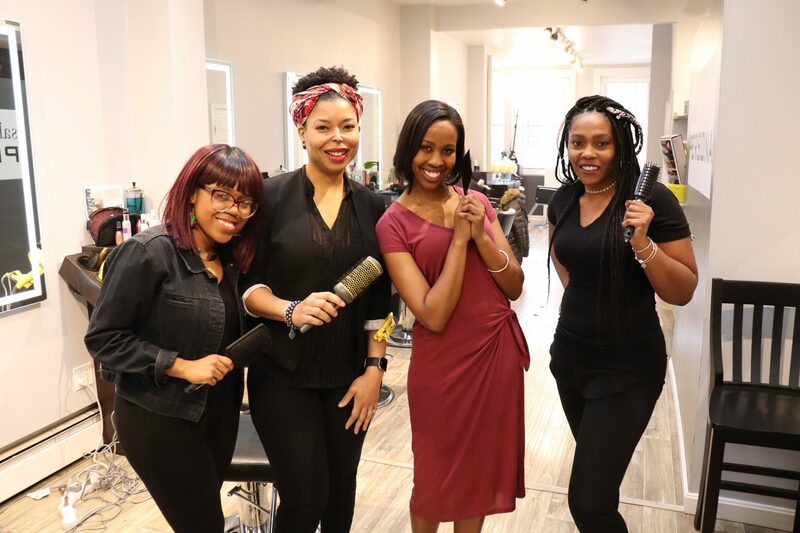 Our community, #pressedgang, engages with us on our blog that covers everything textured haircare, and on our social media accounts that not only gives tips on haircare but also on healthy lifestyle (including food) that will ultimately impact hair health. We plan to be the first national chain of hair salons that service the specific needs of women with highly textured hair. 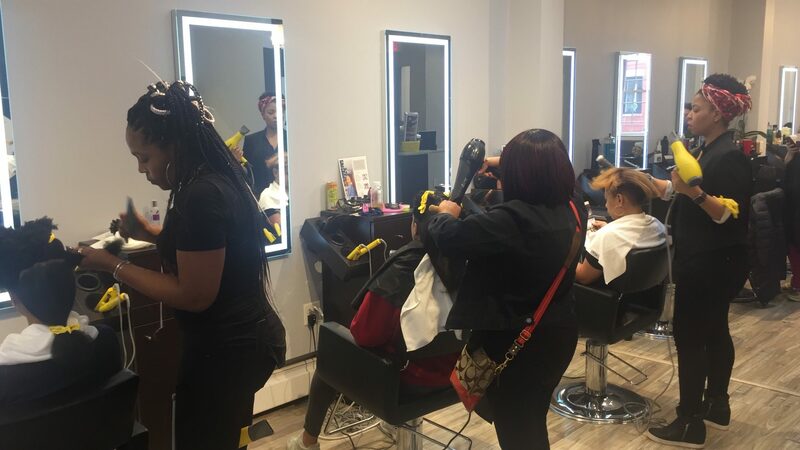 We are beginning by doing pop-up shops in major cities across the United States (The first pop-up shops have happened on Newbury Street) and then we will open a salon that we plan to quickly franchise across the country! I truly believe that the characteristics that I built as an athlete have been the most important to my success. 1. As an athlete, I learned early on that failing is part of the journey! Every single shot that I take will not go in – but if I don’t shoot, I’ll never score. 2. I also learned that success is like an iceberg. As an athlete, most people only see the game day results – the tip of the iceberg. That 90 minute show that ends in a win or a loss. Nobody sees the part of the iceberg that’s under the surface of the water. The grueling hours of work that the players have to put in during off-hours just to be able to perform on game day. To be a great athlete, you have to work when your opponents are sleeping. I learned the true definition of work ethic as an athlete that has carried on to every other aspect of my life. 3. I also learned early on to control the controllables. As an athlete, there are a lot of things that can impact the flow of the game – the referee, the weather, the other team. At the end of the day, you can’t control any of those things. All you can control is how you play and perform. I learned early on not to waste time and energy worried about things that I can’t control, but to instead focus on the ways that I can contribute and do my best.